In this article, the plausibility of walkers or mechs, will be judged and compared with real-world technology. 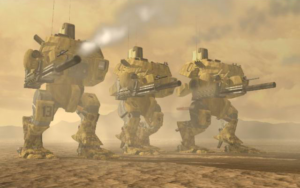 The line between a battle suit and a mech may get fuzzy at times, but this article will only focus on those units that are obviously too large to be merely “worn” by their pilots. Scrin mechs will not be covered, as the purpose of the article is to examine the technology, which is completely unknown in the case of aliens. 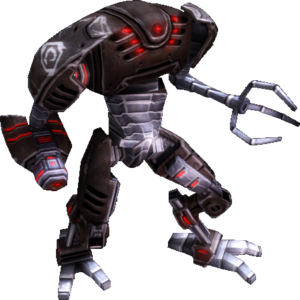 Mechs first appeared in Tiberian Sun and continued to feature in the tiberium universe, but also show up in the Red Alert universe, mostly within the third game. 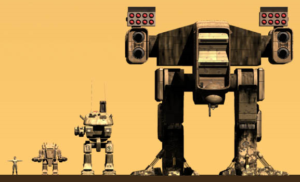 Mechs have become a staple of futuristic militaries throughout science fiction and real world developments in walking machines have yielded some impressive results. It would almost seem the present and the future are on the very beginning of a merger. Unfortunately, real world walkers are more often gimmicks attempting to simulate fiction or show off advanced systems for concept purposes. Functional real-world walkers fulfill extremely specific roles and lack virtually any versatility beyond that singular scope. Wheels are the most simple form of contact locomotion, as they are just circles. Anything other than a circle is going to be more complicated, and adding complication is never a good thing for military equipment that must survive harsh abuse while requiring minimal maintenance. Wheels are not ideal for all scenarios, however, and sometimes more complication is an acceptable tradeoff for other benefits. The continuous tracks used on tanks provide superior weight distribution and traction compared to wheels, they are also more resistant to damage, albeit with the caveat of a shorter overall life expectancy. The disadvantages of tracks are increased complexity and lower speeds. Putting legs onto a vehicle would have worse weight distribution, worse traction, higher vulnerability to damage, far more complexity, and even lower speeds. The only significant advantage would be more versatility when facing obstacles while tracks’ only real answer is crush everything. Since legs are the defining feature of walkers, this already puts them off on a bad start, but the issues don’t stop here. As has been covered in the article on super-heavy tanks, it is preferable for a combat vehicle to never be hit at all than be hit and survive the impact. Mechs completely throw this concept out and are constructed vertically as opposed to horizontal. Adding height makes it more difficult to conceal the vehicle behind terrain or other barriers for cover. Greater height also raises the vehicle’s central point of mass, allowing it to be toppled much more easily than a vehicle built closer to the ground. Depending on the strength and mobility of the mech’s limbs, righting itself without any assistance could be an advantage over most other combat vehicles, although not flipping over in the first place would still be the better alternative. Losing the ability to make use of natural protection, like a hill or rocky outcrop, makes mechs far more vulnerable and dependent on their own durability against enemy attacks. Such a dependence would be ill-advised; this next major problem to address is their incapacity to have hulls anywhere near the thickness of a tank. Due to the high complexity of a mech’s limbs, weight and balance are huge considerations. Inertia from throwing too much weight around could easily tear a mech’s joints apart. The square-cubed law states that when scaling up an object in size, its volume will increase faster than its surface area. Since the physical properties of materials remain unchanged, the larger you build the mech’s limbs, the more fragile they will be when it comes to the stresses they must endure during operation. Weight is also determined by volume, so inertia will also become increasingly significant the larger the mech becomes as well. This means constructing limbs that can survive their own operation will be a hurdle long before slapping extra material on for protection can even be considered. Even if thick plates could be added, the joints will always be an exploitable weakness. A projectile wouldn’t even need to reach the joint directly, just an impact that would place too much stress on it would suffice. Arm-mounted weapon systems could be just as hazardous to the mech’s weak points as enemy fire, especially from asymmetric cannons, like those seen on the Titans, where the imbalanced recoil would inflict incredible wear on the joints. Even tanks, which would suffer fewer effects, don’t offset their main gun. Supplying ammunition to an arm mount would also be additional complexity. For these reasons, energy-based weapons would obviously be a much more suitable system for a mech if power supply wasn’t an issue. The original Juggernaut deployed a support brace before firing its triple-barreled artillery. If the packed up form wasn’t so poorly balanced that it would faceplant at the first opportunity, this firing mechanism actually might make some sense, as the joints could be locked in position to negate the wear caused by the heavy guns. 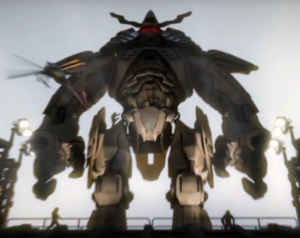 In Red Alert 3, the King Oni is depicted jumping at the end of the intro cinematic. This function is never shown in-game, as it never should be, since launching such a massive vehicle into the air using only the strength of its own legs for propulsion would likely be more effective at destroying it than a proton collider to the face. While it is forced to keep its feet on the ground, its Bull Rush secondary ability allows it to charge at high speed into enemy units. This act would quite possibly be the second most effective way to destroy the mech right after jumping. The physical limitations of mechs are numerous, but before we can part ways, there is another nail to be placed into the mech coffin. Complexity in design is not only bad for durability, it is also bad for cost. Mechs are incredibly expensive. Although most modern mechs are only prototypes, even those few that are intended for commercial production come with an extra digit or two more on their price tag than one might be willing to fork over. Even a small, single person mech smaller than an average car, without any weapons or protection, can cost more than a lavish house. Because of their significant weaknesses, there is no option to sacrifice a little quality to cut costs, doing so would just result in a heap of scrap metal. The cost ineffectiveness of mechs are similar to super-heavy tanks, except even worse. Instead of wasting resources on buying one very vulnerable mech, it would be better to buy two super-heavy tanks.